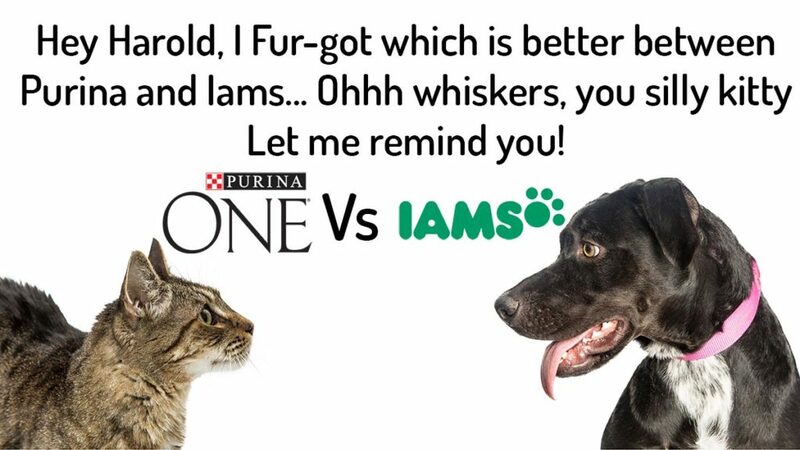 Iams vs Purina One 2019 : Battle Fur-mation for Pet food of the year! Ever been confused on which brand to pick while staring at the various pet food labels on the counter in a grocery store? You cannot choose a brand that will appeal to your pet without being equipped with information. Our furred buddies may just look the other way when it is meal time. By the end of this article all your questions on pet food nutrition and its complexities will be answered. Also, you will learn how to pick the best pet food brand for your fuzzy bestie. In this segment, we will provide a well-structured comparison on two renowned brands, Iams and Purina One. You can look forward to insightful information on nutrition, product safety, ingredient quality, price, brand history among others. After you are done with this awesome comparison checkout Iams and Purina One here to see the different flavors and pricing. Purina One provides a higher amount of protein both for the dog and cat food alike. It exceeds with about 4.15 percent for the dog category and 3.30 percent for the cat food category whereas Iams still meets adequate protein requirements for pets development. There is hardly any difference between the cost for both brands as they have almost the same price tag. While insignificant, there is a slight but negligible difference in cat food price as Purina One food product is higher by $1.80 cents in the wet food category and by 2 cents in the dry food category. Iams takes the lead as far as flavors go. For dog food, it has 28 recipes in the dry food group and 10 recipes in the wet food class. whereas Purina One has a considerable amount of flavors also. The dry dog food category has about 14 recipes, and wet food has 15 recipes. The brand has 3 dog treats. For dry cat food, Purina one has 11 recipes, and 12 recipes for wet cat foods. They have no cat treats. Which one has more recalls? To ensure product safety, brand products are sometimes recalled when a threat is sensed or seen. Both brands have limited history of recalls. Iams has 2 recalls while Purina One has been recalled only once. As depicted on the table below, Iams has a wider product range with about 85 recipes and treats across dog and cat food range. Purina One has an impressive aggregate of about 55 recipes and treats also. Iams and Purina One are renowned and establish food brands, and as such, the dietary components of their food products should be appraised to see if they meet AAFCO’s requirements. The major nutritional components that are used as yardsticks to measure how nutrient-rich pet food brands are include protein, fat, and fiber. As demonstrated in the cat food category above, Purina One is more protein-rich than Iams. Conversely, Iams supplies a richer content of fat and fiber than Purina One. It is interesting to note that, in wet cat food, Iams supplies fiber in a double fold. Purina One also takes the lead in almost all categories for dog food. Protein is a very essential part of the canine and feline diet; this is because their body depends on it solely for wellness, vigour and life itself! Protein contains the essential amino acids needed by cats and dogs. Protein increases dogs’ level of hyper activism and cats also use protein as energy. Fat is, arguably, the most misunderstood nutrient. Here is the deal, your pet needs it in the right percentage. It provides energy in more proportions than carbohydrate and protein. Apart from making food tastier, it helps pet’s skin to and hair retain its sleekness. You don’t want an unattractive pet. Don’t worry, fat does not clog animal heart like they do to the human heart. Remember to only feed them with just the right amount. Ever wondered why every food label has fiber listed amongst nutrients? Without fiber, your pet will probably be constipated every other day. It contains complex carbohydrates that aids digestion and allows nutrients to flow easily into the bloodstream. Budgeting is critical to making a decision on what food brand to go with or avoid. You don’t want your pet getting to love that brand that you cannot consistently pay for. Budgeting can be very dicey; there is price per pound and price per calorie. The recommended metric will be to budget using kcal to avoid factoring in the moisture content that is inclusive while weighing per pound. However, your shopping habits will help you decide what is economical or not. So where is the best place to purchase these brands? Good question! Overall, chewy.com has the cheapest prices. They also offer 30% on your first autoship order which saves you a good chunk of change and makes your pet food ordering process automatic. Overall, this has saved me a ton of time. Monosodium Phosphate, Carrots, Choline Chloride, Tomatoes, Spinach, Green Peas, Minerals (Ferrous Sulfate, Zinc Oxide, Sodium Selenite, Manganese Sulfate, Copper Sulfate among many others. Purina One has products in different flavors and they are combined in different ways and made into different recipes. These ingredients include Chicken, Turkey, Venison, Beef, Rice, Salmon, Tuna, Sweet potatoes, Lamb, Ground Wheat, Animal Digest, Soybean Flour, Soybean Hulls, Corn Germ Meal, Whole Grain Corn, Whole Grain Wheat, Poultry By-Products, Turkey By-Product Meal, Soybean Protein Concentrate and much more. Iams has been in operation since 1940 and it has maintained a good brand positioning till today. This brand places emphasis on good nutrition for dogs and cats with their superior ingredients. They produced the first animal-based protein ingredient in the 1950’s and they still boast of protein-rich recipes till date. This outstanding brand is a subsidiary of Nestle Purina Pet Care. They take pride in constant innovation as they consistently create new formulas to improve on pets’ health. They are famous for their targeted recipes that provide tailored meals for pets across all life stages. They produce food products with the best ingredients and quality. This was a tough battle as both brands have close features. Their prices are almost the same and there is really no appalling rate of recall for both brands. Iams has more variety than Purina One but the latter has a commendable number of recipes. Purina One makes up for this with their age-specific products range.